Tinnitus, or ringing in the ears, can be an annoying — or debilitating — problem, leaving sufferers anxious, depressed, and unable to sleep. Remedies like relaxation therapy and sound machines can help older people who suffer, but is there a cure for tinnitus? To date, there is no cure for tinnitus. In the absence of a cure, most treatments aim to mask the sounds, using a table-top device or earplugs which generate white noise to compete with, or hide, ringing or buzzing in the ears. Other therapies, like relaxation instruction or counseling, help sufferers learn to cope with and ignore the noises they hear. Hearing aids, by improving hearing generally, may make tinnitus less troublesome. Researchers are investigating ways to keep the brain from perceiving phantom sounds — the hallmark of tinnitus. Since the condition is more prevalent in older people, and can occur as a consequence of age-related hearing loss, some scientists have targeted brain changes that seem to occur as a faulty adaptation to a diminished sense of hearing. The approach builds on past research that suggests that exposure to loud noises causes the auditory cortex in the brain — the region responsible for hearing — to react improperly to some sound frequencies it can no longer hear. This adaptation, or neuroplasticity, leaves the neurons in the brain perceiving sound, when no sound exists. A team of researchers from the University of Texas at Dallas, and an affiliated medical-device firm called MicroTransponder, believe the brain's ability to adapt can help it shift back to normal function. In a 2011 study published in the journal Nature, they report having reversed tinnitus in rats using a technique called Vagus Nerve Stimulation(VNS), along with targeted exposure to specific sound frequencies. The team, led by neuroscientists Michael Kilgard and Navzer Engineer, exposed a group of 18 rats to intense, high-frequency noise, in an attempt to induce tinnitus. When tested, the noise-exposed rats were unable to detect silence in certain sound frequency ranges. Normal rats retain the ability to hear silence, or a lack of sound when no noise is present. Next, the scientists attempted to "reset" the rats' brains, by using electrodes to stimulate the vagus nerve in the animals' necks, while simultaneously exposing them to specific frequency ranges that differed from the tinnitus range. The goal was to compete with the tinnitus frequency, thereby prodding the brain to respond accurately, and appropriately, to all audible frequencies. Vagus nerve stimulation is considered a simple way to mimic a much more invasive technique used in past animal studies. Those involved electrical stimulation of a group of neurons or nerve cells in the forebrain, the area responsible for sensory perception and language. Pairing stimulation of these cells with different sensory stimuli has been shown to trigger beneficial and long-lasting changes in brain function. VNS is currently used in more than 50,000 humans to treat epilepsy and depression, without significant side effects, according to the University of Texas research team. 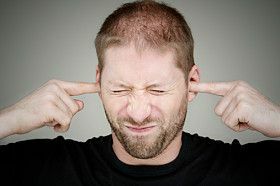 Indeed, in this experiment, funded by the US National Institutes of Health, rats tested after VNS and multiple-tone exposure had their problem detecting silent gaps eliminated, leading the researchers to conclude that their tinnitus had been reversed. Even better, the effect persisted for weeks after the end of the experiment. Research on an implantable device for humans is underway. The device includes headphones, and an implanted battery and wires to deliver an electrical charge to the vagus nerve when a tone is heard. A number of drug therapies for tinnitus are being researched by scientists, including novel ways to deliver the medication. For example, Draper Laboratory, under contract to the US Department of Defense, is developing a tiny device to send medication directly to the middle ear, and then dissolve once its drug supply was depleted. Tinnitus is of concern to the military, as it ranks as the top disability among returning soldiers, according to the US Department of Veterans Affairs. Engineer, Navzer D; Riley, Jonathan R; Seale, Jonathan D; Vrana, Will A; Shetake, Jai A; Sudanagunta, Sindhu P., Borland, Michael S., and Kilgard, Michael P. "Reversing Pathological Neural Activity Using Targeted Plasticity." Nature, ISSN 0028-0836, 02/2011, Volume 470, Issue 7332, pp. 101 - 104. Interview with Michael Kilgard, Senior Author. Conducted March 11, 2013. Holmes, Susan. "The incidence, management and consequence of tinnitus in older adults." Reviews in Clinical Gerontology [0959-2598]2008 vol:18 iss:04 pg:269-285. New Treatment Options for Tinnitus Sufferers. US Department of Veterans Affairs Public Information Sheet. Tinnitus. US NIH National Institute on Deafness and Other Communication Disorders (NIDCD)Public Information Sheet. What Causes Ringing in Your Ears as You Age? Which Type of Tinnitus Are You Experiencing? Can Ginkgo Help Tame Tinnitus? What Remedies Are Said to Cure Tinnitus? What Is Causing Fluid to Accumulate in Your Ear? Are Allergies the Cause of Your Recurrent Ear Infections? Could Your Child Have Fluid in Their Ears? What is Perichondritis of the Ear?